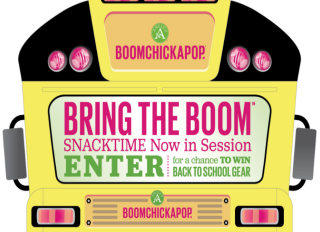 Angie’s Boomchickapop “Snacktime Now in Session” Sweepstakes – Win a MacBook Air & more! Win an 11-inch MacBook Air & more (6 winners)! ENTER SWEEPSTAKES HERE – Angie’s Boomchickapop Sweepstakes page. ENTRY LIMIT – Limit one (1) entry per person/email address/Facebook account or postmarked outer envelope per day, regardless of entry method. ELIGIBILITY – BRING THE BOOM™ “SNACKTIME NOW IN SESSION” SWEEPSTAKES IS OPEN ONLY TO LEGAL RESIDENTS OF THE 50 UNITED STATES OR DISTRICT OF COLUMBIA, WHO ARE THE AGE OF MAJORITY IN THEIR STATE OF RESIDENCE OR OLDER AT THE TIME OF ENTRY. SWEEPSTAKES ENTRY PERIOD – Sweepstakes begins at 12:00:01 a.m. (midnight) Central Daylight Time (“CDT”) on June 13, 2016 and ends at 11:59:59 p.m. Central Standard Time (“CST”) on December 15, 2016. PRIZES – First Prize (6 total; 2 per Drawing): One (1) 11-inch MacBook Air; one (1) Boomchickapop branded MacBook case; one (1) Boomchickapop branded skin for MacBook; and one (1) BOOMCHICKAPOP® Big Bag filled with 25 BOOMCHICKAPOP® Sweet and Salty Popcorn 1.0 oz bags and 25 BOOMCHICKAPOP® Sea Salt Popcorn 0.6 oz bags. ARV: $1,038.00 each First Prize. bag each of BOOMCHICKAPOP® flavors: Sea Salt, Sweet & Salty, Lightly Sweet and White Cheddar. ARV: $312.77 each Second Prize. Third Prize (72 total, 24 per Drawing): Boomchickapop branded backpack; one (1) Boomchickapop branded Bento lunch Box; one (1) Boomchickapop branded journal set with pencils; one (1) BOOMCHICKAPOP® 6 packs of Sea Salt; and one (1) BOOMCHICKAPOP® 6 packs of Sweet & Salty. ARV: $99.98 each Third Prize.